As a blogger, you’ll have heard the advice a hundred times before. But you haven’t done it – yet. Of course, you understand why it’s good advice. Drive traffic to your latest blog posts. Deepen relationships via subscriber-only content and surveys. Send targeted offers that help you earn a little money from your blog. But the practical side of things has you stumped. Sure, signing up to an email provider like AWeber, MailChimp or Mad Mimi is easy enough, but what happens next? How do you go from proud owner of a shiny (but empty) new email list, to happy blogger with an active and growing subscriber base? In other words, how do you actually get people to sign up to your list and make them profitable for your blog. 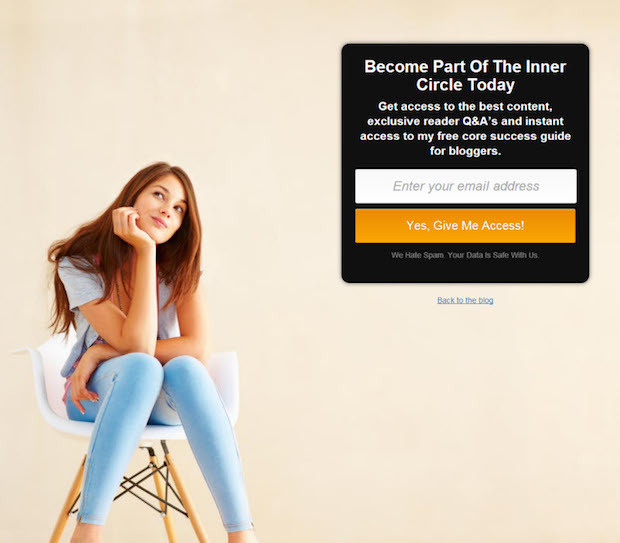 Do you want to know the secret to turning a casual reader into a blog subscriber? Show them an opt-in form and get them to complete it. I told you it was stupidly simple! How can I create a professional-looking opt-in form? Where should my opt-in form appear on my blog? What are the different types of forms and do I need more than one? And even when you have a beautiful form to show your visitors, you still need a juicy incentive to tempt them to sign up. But most people don’t get that far because they remain stuck on the first part – creating an effective form. The good news – as long as you’re running a self-hosted WordPress blog, dozens of plugins are available for creating high-quality opt-in forms (in fact the Smart Blogger team have developed their own – Unpop). The bad news – dozens of plugins are available! So how do you choose the right one? Before we navigate all these options, let’s look at some of the different types of opt-in forms available. If you browse popular blogs, you’ll likely see many different types of opt-in forms with different designs in different combinations. But when you boil it down, there are just 7 different types of forms. The blog sidebar is historically the most common place to add an opt-in form, so it’s the place where most people would expect to sign up to your list. Always use this type of opt-in form unless the space could be better occupied by an ad. To counteract the blindness issue, a sidebar form is best combined with another type. A popover opt-in form literally pops over the blog, obscuring the content and demanding attention. Use popovers when sign-ups are the number-one priority, even if it’s at the expense of user experience. Feature boxes typically sit just below your blog’s header and navigation area. Some bloggers just use them on their homepage alone, whereas others use them on a select number of posts or pages or even across the whole blog. Use a feature box when sign-ups are a priority but you don’t want to seriously affect user experience. An after post opt-in form is self-explanatory – it appears immediately after a blog post. Always use an after post form unless you have another important call to action to display below your posts instead (e.g., to promote a product). A slide-in is an opt-in form that is initially hidden (or at least minimized) then slides onto the page — after a certain delay or triggered by some other event. It usually appears in the bottom right or bottom left corner of your blog. Use a slide-in when sign-ups are a priority and you don’t mind drawing reader attention away from your content. A notification bar appears in the header or footer of your blog and typically remains fixed and visible as a user scrolls down the page. Use a notification bar when you want your opt-in form to be visible all the time without being too obtrusive. 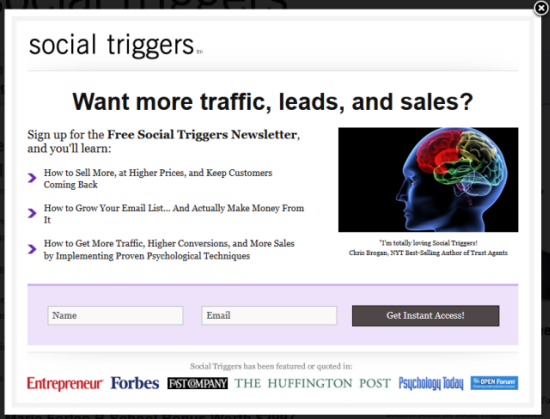 Also use it if you wish to drive traffic to a separate landing page. A landing page is an entire page dedicated to your opt-in form. Landing pages offer 100% focus on your offer, but unlike a popover, the reader has usually chosen to visit the page. Landing pages are actually a separate class of opt-in form with plugins dedicated exclusively to creating them. Use a landing page when you have an external source of traffic (i.e., a guest post) or need more room to describe your sign-up incentive or explain the benefits of subscribing. You won’t find a shortage of list-building plugins on the market. I’ve tested a significant number on real blogs and experienced varying levels of success. What follows isn’t intended to be an exhaustive list of all the available options, but a curated set of WordPress plugins I believe represent the cream of the crop. Some of these are paid products, but I’ve included some free plugins too – or plugins that have a free version. On a personal note, while free is everyone’s favorite price, I value the additional support and functionality offered by the premium plugins. The first few list-building plugins I ever tested on my blogs were extremely limiting, particularly regarding customization. Sure, they allowed me to change a few basic elements, but anything more than that required an in-depth knowledge of CSS. That’s why I was delighted to find Thrive Leads, which comes with a range of pre-designed templates and a live editor that allows you to customize almost everything. Sidebar, popover, slide-in, after post and squeeze page. One of the most interesting things about the OptinMonster plugin is a feature called exit intent. The basic idea is to display an opt-in form at the moment just before someone leaves your blog. It does this by tracking mouse movements and displaying a popover when it thinks the reader is about to click away from the page. This plugin also has a modular design, which means you only need to install the features you plan to use. This keeps the impact of the plugin on your server to a minimum. Sidebar (certain plans only), popover, notification bar (footer) and slide-in. One particularly useful feature is the ability to show existing subscribers a different offer – or nothing at all. This is valuable because displaying an opt-in form to someone who’s already on your list is a waste of time and blog real estate. The Dreamgrow Scroll Triggered Box is a handy plugin for creating slide-ins. It also has the advantage of being free! It allows you to target readers who are actively reading your content by displaying a slide-in box once the reader has reached a certain scroll percentage. The only real limitation is it requires you to know CSS to get the box looking exactly the way you want. The default design is acceptable, but just be aware that using the same style as everyone else can lower conversions. Magic Action Boxes is a powerful plugin that focuses on after post opt-in forms, but it also supports a few other types. 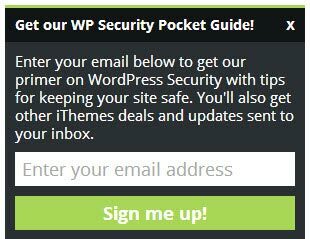 The big difference with this plugin is it allows you to select your opt-in form directly from the Edit Post screen within WordPress. So you can easily choose to show an opt-in form tailored to the current content, for example, featuring highly relevant sign-up incentives. However, you can also specify a default form for other posts. A limited functionality version of this plugin is available for free and this is a great way to test-drive the plugin before purchasing. Sidebar, after post, popover (paid version only). Hello Bar allows you to create highly-visible notification bars that are anchored to the top of the screen. You can use these to display a simple opt-in form or a call to action to funnel traffic to a landing page. Hello Bar is more than just a WordPress plugin because it gives you the option to generate the code to create the notification bar without actually needing a plugin at all. The setup process asks whether you want to display a call to action or form then allows you to customize the bar’s look and feel. Then it generates the HTML code or a customized WordPress plugin based on your settings — something I’ve never seen before. One drawback — it’s limited to Aweber, Campaign Monitor, Constant Contact and MailChimp without the option to add other providers via custom HTML forms. If you want to get serious about list building, start using landing pages. A landing page is a standalone page, free of other distractions, whose sole purpose is to get the reader to take a particular action — in this case to opt in to your email list. But landing page design and layout are critical to their success, and in the past this has meant paying a designer or developer to create one for you. These days, however, you can find some extremely powerful plugins that put control back in your hands. 1) LeadPages – It’s Not Just a Plugin; It’s a Platform! LeadPages is an incredibly powerful platform that allows you to create many different types of conversion-focused pages. Whether you want to create landing pages, squeeze pages, sales pages, webinar pages or something else, LeadPages has you covered. LeadPages is a hosted solution so you don’t even need to use WordPress, although a plugin is available that integrates with it. It also supports a unique type of 2-step opt-in called LeadBoxes. These break down the process into smaller steps to reduce the perceived effort required by the reader to sign up. Price: Starts at $37/month but you will need to upgrade to $67/month to get access to split testing. OptimizePress (affiliate link) is my go-to platform for creating professional-looking landing pages. It has a drag-and-drop editor that’s extremely easy to use, but if you want to get down to the code level, you can use shortcodes too. In truth, OptimizePress is much more than just a plugin for creating landing pages — it’s also a fully-fledged WordPress theme with a membership plugin bundled in. So if you’re thinking of creating a members only area on your blog, you could save yourself $100 to $300. Like LeadPages, OptimizePress also supports a wide variety of conversion-oriented pages, and a recent update called Overlay Optimizer now supports 2-step opt-ins too. Coming Soon Pro is one of the most functional coming soon and maintenance mode plugins available. A plugin like this is handy if you started a blog, but you haven’t actually launched it yet. While it might sound crazy to build a list before you even have a blog, it’s the exact strategy Jon used to get over 13,000 subscribers for Smart Blogger before he’d written a single post. This strategy works best if you have a valuable incentive to offer visitors when they subscribe – Jon has his Headline Hacks report. If you link to your coming soon page from a guest post on a popular blog, you’ve got yourself a great way to start building your list – even if you don’t have a blog yet. The plugins above will allow you to create opt-in forms and landing pages to your heart’s content. The way you combine different opt-in forms is crucial. Get it wrong and you could ruin the user experience and effectively turn away visitors, losing you readers and new subscribers. For example, using popovers and slide-ins together could be a recipe for disaster. And if you already have a floating share bar such as Digg Digg, that could worsen the situation. A useful rule of thumb is to only have one type of “sticky” opt-in form, i.e., one that follows the user as they scroll down the page. The only way to be certain of finding which plugins, and combinations of plugins, are best for your blog is to test them. Some plugins provide support for split testing to help optimize lower-level features such as text and button colors, but truthfully, testing different combinations of plugins is tricky. Inevitably you’ll experience a degree of trial and error. So I recommend starting simple and then experimenting with different forms once you’ve established a baseline. Are You Ready to Get Serious About Building Your List? You’ll have heard it many times before, but it’s still true. Building an email list is one of the smartest things you can do with your blog. However, it’s all too easy to put it off for another day. Yet in reality, every day you delay, another group of potential subscribers slips through your fingers. Subscribers that would take you another step closer to making your blog the success you know it deserves to be. So what if today were different? 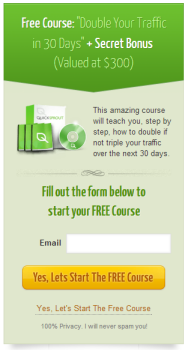 What if today you took the first step to getting the traffic you always dreamed about? What if today was the day you decided to become a serious list-builder? Because lack of technical know-how is no longer a valid excuse for not creating a killer opt-in form. Neither is a lack of money to pay someone else to create one for you. The plugins above make it easy and cost-effective to create forms and landing pages to rival the web’s most popular bloggers. So take another look at the list above and pick the plugin that you’ll try first — and take action. And believe me, pretty soon you’ll be damn glad you did! About the Author: Adam Connell is the Founder of Blogging Wizard and spends most of his time training people to get better results from their blog. If you want to blog smarter and not harder, download his free guide here and learn how to skyrocket your mailing list subscribers today.